On the weekend of 18th & 19th May, 30 gardens in Wivenhoe will be open to the public for visiting. Gardens are open from 11am to 5pm (some only for one day). Buy a programme for £5 at St. Mary's or at other selling points. Christian Aid Week is 12th to 18th May, and on the following day, Sunday 19th May, there is to be a lunch at Wivenhoe Sailing Club to raise funds for Christian Aid. Gill Black is the Church's Christian Aid Co-ordinator: telephone 01206 826186. As Clergy and Churchwardens already know, this year's Visitation Service will be led by the Bishop of Chelmsford, and it's at Kingsland Church in Lexden (above Aldi) CO3 9DW at 7:30pm on Thursday 23rd May. As well as admitting Churchwardens, Bishop Stephen will speak about the Diocesan Church Planting initiative, and it would be good if anyone in the Parishes' ministry teams - or anyone else with an interest - would come along. Car parking will be available at Lexden Springs School, Halstead Road, Colchester CO3 9AB (after 6pm) and the small municipal car park on London Road CO3 4DF. So share a car if you can! There is to be face-to-face 'C2' Safeguarding training in our Deanery this autumn - and remember that this is mandatory for those who have safeguarding leadership responsibilities or responsibility for leading activities involving under 18 year olds and/or adults who may be vulnerable due to age, illness or disability. It's taking place in St. John's Church Colchester on Saturday 12th October from 9:30am to 1pm. Yes, it's some time away - but why not book in right now, as the time (and the places) will soon go! We recommend that Churches display this poster, which also tells our members and the public that we take safeguarding seriously. The Deanery Standing and Pastoral Committee have published a draft Deanery Vision Plan for the decade 2020-2030, which has been sent to all members of Deanery Synod and PCC Secretaries, for review on PCC and response by Friday 14th June. The Plan, and the covering letter from the Area Dean and Lay Chair, can be viewed and downloaded from the Vision tab of our website. Essex Police are pointing people to a short film: 'Breck’s Last Game' (15) about 14-year-old Breck Bednar who was murdered in Grays by a man he met on a gaming site. The film was made to raise awareness of online grooming and carries an important message – do you really know who your online friends are? The film is being rolled out into schools across Essex with screenings taking place as part of a comprehensive lesson plan designed to raise awareness of online grooming and exploitation. The film has been made with the support of Breck’s mother Lorin LaFave and The Breck Foundation. For more information about how to spot the signs of online grooming and what to do if you’re concerned about a child you know, visit our website:https://www.essex.police.uk/adv…/child-sexual-exploitation/… Our thanks to Revd Julia Murphy for passing this on. Essex Police have alerted us to a resurgence of lead thefts in the Colchester area. It has spread west to east across north Essex, with two incidents reported on residential properties in Mile End. Please encourage all members and local residents to be vigilant! Christian Aid Week: Would you host Bishop Roger? The focus of Christian Aid Week 2019, from 12th to 18th May, is maternal health in Sierra Leone, where 10 mothers die in childbirth every day. Christian Aid raises awareness and provides practical help, with health centres, training, finance, education and more. Bishop Roger will be walking in solidarity with mothers who often have to walk several miles to the nearest health facility, and he is looking for Churches to host an event on that day - such as a 'Big Brekkie (see the Christian Aid website), Afternoon Tea, toddler group event - or anything which would raise this topic in the community. There's more information in this document. St. Albright's Church in Stanway are hosting a performance by the Bachl Choir from Linz, Austria who have offered to come and sing in the Church during their short stay in the UK this spring. 'Easter in Song' will be on Saturday 27th April at 7:30pm and will be a programme of sacred classical music and Austrian folk songs. For more information and to reserve tickets, contact Revd Tony Bushell on 07484 265258 or vicartone@aol.com. This poster will help promote the event in our Churches! 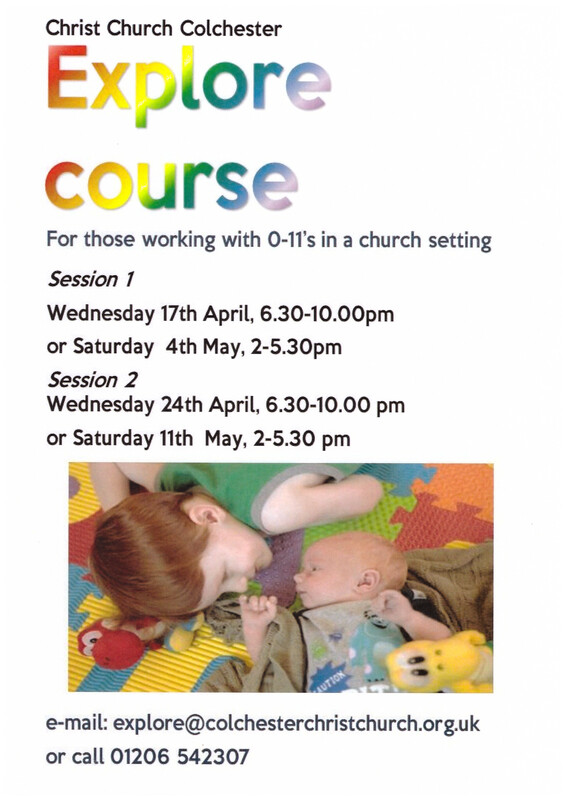 Do you work with children aged 0 to 11, in a Church setting? Challenging but satisfying, isn't it? 'Explore' is a course for all involved in children's ministry, to provide the opportunity for learning and renewal. The course is over two sessions - Wednesdays 17th & 24th April, 6:30pm - 10pm or Saturdays 4th & 11th May from 2-5:30pm. Or you can mix and match the dates! It will use a mix of interactive and teaching material. There's no fee, but a donation would be appreciated for materials and coffee. Book by email to explore@colchesterchristchurch.org.uk or call 01206 542307. Here's a poster to encourage people to book in. The fellowship of Fordham and Eight Ash Green will shortly be welcoming a new Associate Minister - Revd Francis Blight is to be licensed on Thursday 13th June in Fordham Church. Francis is currently Assistant Chaplain at Christ Church, Amsterdam with Heiloo, of the Diocese of Gibraltar in Europe. Our new Archdeacon, Revd (to be Venerable) Ruth Patten, who is currently the Priest-in-Charge of the Parishes of Great Dunmow and Barnston will be welcomed at the service of Collation and installation on Sunday 12th May at 3:30pm in the Cathedral. Ruth has always served in the Colchester Episcopal Area, having served her Curacy in Witham before taking up her current role in 2014. Advance notice - Carol Singing!! Great news, so mark your diary - it is planned that the Churches in Colchester will be singing carols in Castle Park on Saturday 7th December, to bless the town and get Christmas moving! More details to come. The Spring Newsletter from Beks Korniej, our Deanery Youth Champion, is available on the Youth section of the Deanery website, and can be downloaded from here. There's always so much going on, so do make sure our young people and their leaders are part of it all! Be a Brick, Buy a Brick! Colchester Foodbank charity works in partnership with Wivenhoe and Brightlingsea Foodbanks to provide emergency food to local individuals and families in crisis. The biggest cost is operating the warehouse, at about £20,000 a year. That's where the army of volunteers welcomes clients, as well as receiving, sorting, storing and redistributing food. For the same cost of renting, they could pay to buy a building if they could raise enough for a deposit first. So far, people have generously donated £32,804. 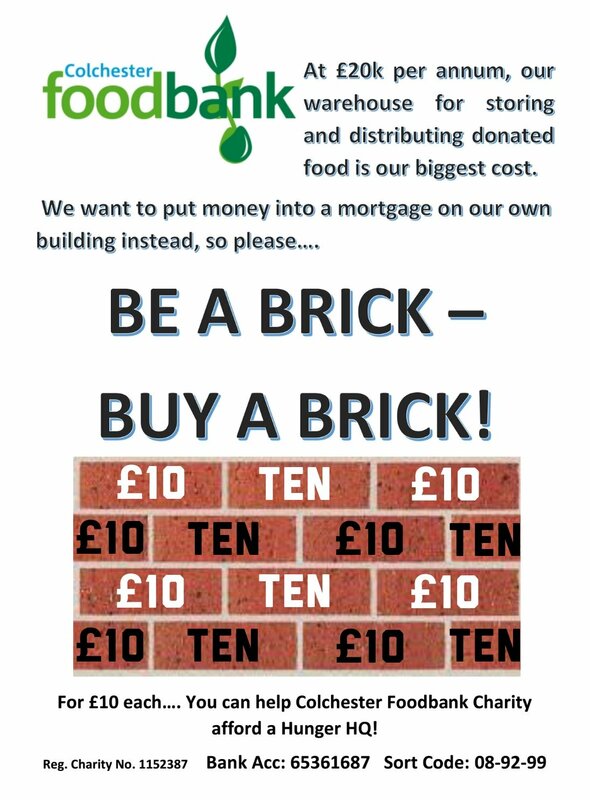 Donate £10 and they will add your name to the Foodbank's wall of gratitude - and an organisation or generous person could buy a window for £500, or a door for £1,000! Donate through Facebook or Just Giving https://www.justgiving.com/colchester-foodbank or directly by downloading either a one-off donation form or a regular standing order from https://colchester.foodbank.org.uk/give-help/donate-money and taking it to your bank. Also see this poster. Just before the November meeting of Diocesan Synod, Bishop Stephen 'doodled' his understanding of Transforming Presence, and circulated it to members. 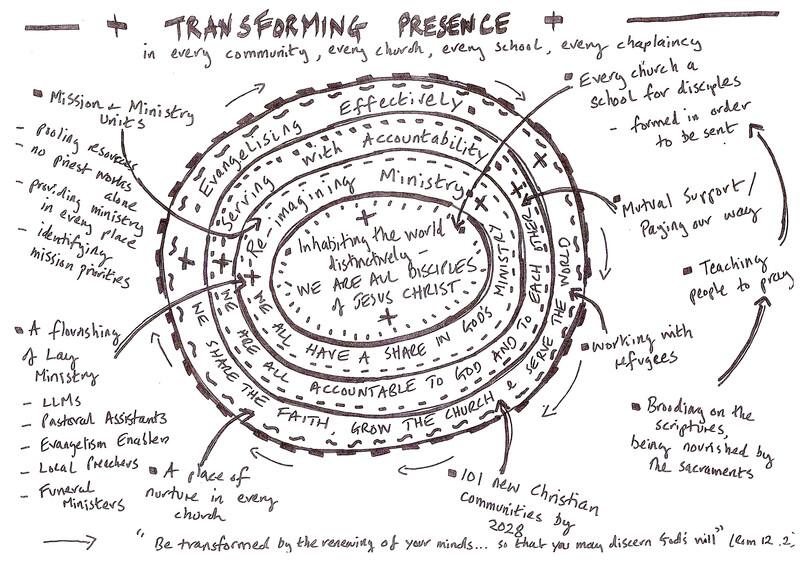 Here it is; it's surely the most concise summary of our vision, and we commend it to you and the Churches! Could you be a Street Pastor? There is an increasingly urgent need for Street Pastors in Colchester. Our Lay Chair Roger Ennals would be pleased to speak to Churches to promote this valuable ministry amongst our congregations. Contact him on 01206 579148 rogerennals@gmail.com with an invitation. Our Bishop runs a regular time of prayer for the town and for our church leaders, at the Oak Tree Coffee House, Highwoods Square, CO4 9BB. Coffee etc can be available from 7.30 am when we will also have a short time of worship and a brief reflection on Scripture. We can then spend some time praying and - if your diary allows - have a bite of breakfast at the end (from about 8.30-ish). Bishop Roger says: "A lot of exciting things happened when Christians in the Town just got together to pray and I am confident that will continue to happen. Please do buzz this around your networks - and if people wanted to let me know if they are coming then that would be great!" A Retreat for your Parish or MMU? Revd Jackie Sams, part of the Diocesan Spiritual Direction Team and a leader of Individual Guided Retreats at Pleshey, can be available to lead a quiet day or retreat for a Parish, team or MMU. If you would like to explore the opportunity, contact her on 01206530586 or by email at revjackiesams@gmail.com. Here's a new kind of 'Parish Share'! One Church in the Deanery recently asked if there's a way of sharing items of equipment, rather than having to hire or buy it. For instance, we know of another Church where there's an easy-to-construct tower which could be loaned out for changing light bulbs etc. What have you got that others could use, and what do you need? We think there's a Biblical principle in this too.... Let us know!